RT Dygert is proud to supply O-Rings that are fabricated with exceptionally high quality materials at very competitive prices. We've established strong, efficient relationships with dedicated suppliers and their performance is constantly monitored by our expert staff of quality and manufacturing specialists. RT Dygert is an ISO 9001-2008 certified company. We monitor and enforce strict inventory control standards to assure your order is shipped accurately and on time. 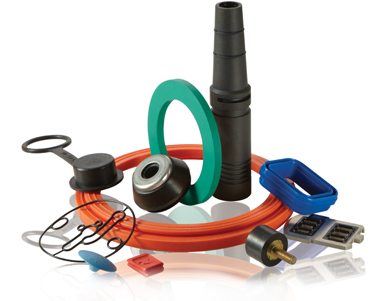 Beyond this, we inventory a vast selection of standard parts made with universally specified materials, so we practically always have exactly what you need immediately available. Check our list of off-the-shelf compounds, then contact one of our trained customer service representatives to place your order today! We warehouse 70, 90, FDA 70 and NSF 70 durometer metric sizes. We warehouse black 75, black 90 and brown 75 durometer metric sizes. We warehouse EPDM, EPDM/FDA and EPDM/FDA/NSF 61 in 70 durometer. We warehouse green 70 durometer. We warehouse O-Rings with silicone core. We warehouse O-Rings with Viton™ core. We warehouse 55 durometer, shore D, virgin PTFE. *Operating temperature ranges are approximate and apply to medium hardness (~ 70 durometer Shore A) compounds. Harder or softer compounds will have different temperature ranges.